Hi Dr. Hortfreud. I'm here for my Spring Readiness Assessment. Good. Let's begin. I'll ask you some simple questions and you give me the first answer you think of. Ready? Carol, there is snow on the ground now. Will this delay your planting of peas on March 17th? Dr. H., absolutely not. It's going to be 50F this weekend, so by next weekend, the ground should be warm enough for me to plant peas, and spinach, and maybe some lettuce. Good. What about pansies and violas? Ha! Dr. H., I know you saw me craning my neck as I drove by the garden center on the way home today to see if they had any in yet. Plus, the owner of another little greenhouse will probably call me the minute she gets some in. 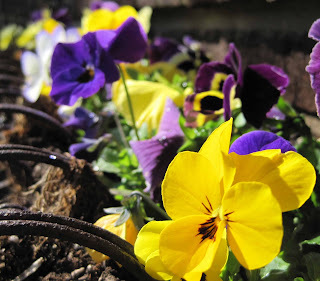 I've got my special pansy and viola containers all ready in the garage and I have potting soil for them, too. Yes, I've ordered all my seeds and they've all arrived. I'll be starting my tomatoes and peppers, and a few other seeds, this weekend. With my stash of peat pots and seed starting mix, I don't even think I need to buy seed starting supplies. Very good. How about cutting back what didn't get cut back last fall? I'm it on, Dr. H. I'm cutting back the Knock Out roses soon and have some special new gloves to wear so I won't scratch up my arms. I've been practicing wearing them, getting comfortable with them. Though, I do take them off to type. Oh, and I bought a new pair of regular gardening gloves, too. Carol, will your gardening pants still fit you? Carol, it sure sounds like you are ready for Spring. I wish for you a wonderful growing season, with ample rain, sunny blue skies, and loads of flowers to brighten your days. Go forth and garden it forward. I'll be here for the season whenever you need me, plus we'll have our regular appointments when you mow the lawn. By the way, is the mower tuned up and ready to roll? Thank you, Dr. Hortfreud. Ready or not, here comes Spring! What a charming discussion. It is so fun to think about the gardening to come soon, and we are all more than ready to begin! If this weekend proves to be as good as promised by the weather people, that is! Well, Dr. Hortfreud is a bit rude isn't he. I'll bet he/she is a bit too big for his/her pants for sure. Lead the way. I am ready. Carol....I absolutely loved this post! You are so clever! Although the Dr. should know better than to ask a woman about her gardening pants!! (Hmmmm, which makes me think, will my spring gardening pants fit me!!??) Looks like you are ready for spring to arrive! Thanks for giving me a smile! I'll bet Dr H's pants are a bit snug too! I'm just itching to get out there! The doctor is getting too big for her britches! Bring on spring! You didn't answer the question about the mower!! !